WADSWORTH, James Wolcott, Jr., (son of James Wadsworth and father-in-law of Stuart Symington), a Senator and a Representative from New York; born in Geneseo, N.Y., August 12, 1877; received preparatory education at St. Mark's School, Southboro, Mass. ; graduated from Yale University in 1898; during the Spanish-American War served as a private in the Puerto Rican campaign in 1898; engaged in livestock and agricultural pursuits near Geneseo, N.Y., and as manager of a ranch in Texas 1911-1915; member, New York State assembly 1905-1910, serving as speaker 1906-1910; elected as a Republican to the United States Senate in 1914; reelected in 1920 and served from March 4, 1915, to March 3, 1927; unsuccessful candidate for reelection in 1926; chairman, Committee on Military Affairs (Sixty-sixth through Sixty-ninth Congresses); Republican whip 1915; resumed agricultural pursuits; elected to the Seventy-third and to the eight succeeding Congresses (March 4, 1933-January 3, 1951); was not a candidate for renomination in 1950; appointed by President Harry Truman chairman of the National Security Training Commission in 1951 and served until his death in Washington, D.C., June 21, 1952; interment in Temple Hill Cemetery, Geneseo, N.Y.
American National Biography; Dictionary of American Biography; Fausold, Martin. 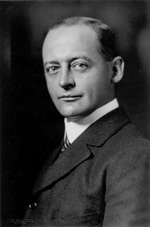 James W. Wadsworth, Jr.: The Gentleman From New York. Syracuse: Syracuse University Press, 1975; Holthusen, Henry. James W. Wadsworth, Jr.: A Biographical Sketch. New York: G.P. Putnam's Sons, 1926.